Swagg Drum Loops Collection - Download the complete collection (Volumes 1 & 2) for all 400 blazin' drum loop patterns in WAV/AIFF/REX2 formats. You get 1,000 files total! Styles range widely from today's hottest swag style grooves all the way to raw hip-hop classics that can't be denied! With the 4 variations for each of the 50 loop themes included (main drum beat, drum beat breaks, drum loop mutes, drum loop fills), you can effortlessly create professional productions with longer phrases without having monotonous drum rhythms! 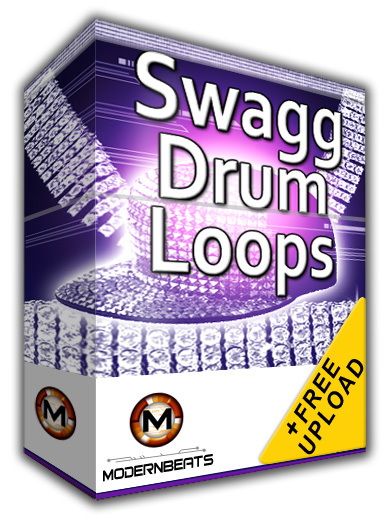 With "Swagg Drum Loops" you aren't confined to only one or two patterns per style like most loop libraries. Now, equipped with the ModernBeats standard, you can build original patterns fast with access to 4 variations per drum loop theme! This amazing 2-volume library will launch your music to another level. Raise the standard, demand the best: "Swagg Drum Loops is a must have!"